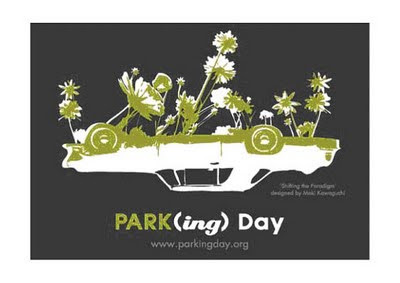 Friday September 16th (this week) will be PARK(ing) day's 5th annual celebration. If you haven't heard of it before, PARK(ing) Day is a one-day, global event, where the public, artists and activists collaborate to transform metered parking spaces into “PARK(ing)” spaces - temporary parks for the public good and enhancement of the urban built environment. One of my favourite London charities Trees for Cities is getting involved working with key artists, charities, designers and creative's to launch this international event in London this week, to coincide with the start of London Fashion Week and London Design Week. By getting involved Trees for Cities is hoping to provoke thought, spark reactions and bring a little humour to unsuspecting Londoners and visitors that stumble across the PARK(ing) bays. In addition to the PARK(ing) bay installations there will be live music and street theatre/ performers to bring the space alive. They will be on Concert Hall Approach, London SE1 on Friday 16th September from 10am - 6pm. This is a busy area near Waterloo and the South Bank Centre so it should be quite a hit. The Green Carpet Runway - a catwalk featuring ethical fashion designers. Two salon style fashion shows will see models from the leading UK model agency -Premier Model Management, model sustainable and upcycled clothing and accessories. The shows will be accompanied by musician Joe Cang providing a live acoustic set. The Parking Bay - An interpretation on reclaiming the urban environment with a humourous take on the term 'parking bay' – using a bay tree. To endorse this concept we are inviting a number of London's finest artists to join us on the day with sculptures and site-specific pieces. The Portable Woodland - a moveable woodland space created in collaboration with Trees for Cities. Highlighting the need for more trees in cities, this exhibit will bring verdant woodland into the heart of London for a day. The Edible Container Garden - an area illustrating the simplicity of growing your own food in whatever space you may have available regardless of the limitations - from a window box, or roof terrace to a small patio. This is a collaboration with the Edible Bus Stop Community Garden Project. In addition to all of these attractions there will be mischievous artistic installations, and a festival theatre troop doing street performances. It will be a creative, design led event with a quirky feel promising a day to remember. Here are some photos from past events from all over the world so you can get an idea of what it might look like. Should be a super fun day!